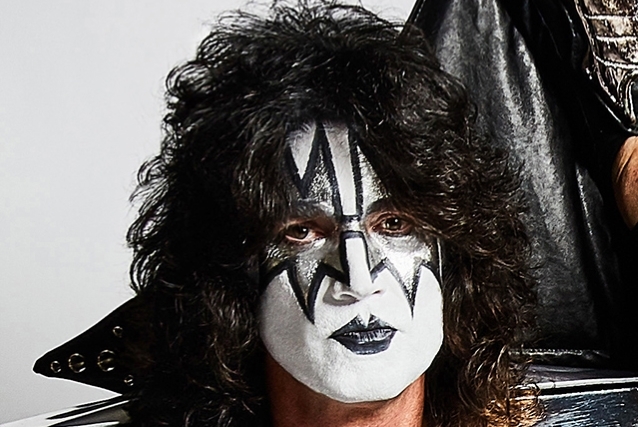 KISS guitarist Tommy Thayer spoke to the Las Vegas Review-Journal about the band's "End Of The Road" farewell tour, which launched late last month in Vancouver, British Columbia, Canada. "It started with Gene [Simmons, bass/vocals] and Paul [Stanley, guitar/vocals], obviously," Thayer said. "I know that they wanted to go out with a tour celebrating 45 years of doing it while the band is still in prime form, go out and do a show that's above and beyond anything we've done and do it while we can still do a show as well as we ever could. We cover a lot of ground in the show. We're covering all the eras." According to Thayer, "End Of The Road" is "a more emotional experience" than previous KISS tours because fans know "that every time we play in a city it's going to be the last time KISS goes on tour and plays there. It's really the last opportunity for KISS fans to come see the band," he said. "It's a lot of emotions, but that's kind of what's charging us on this and getting us pumped up. We spent a lot of time getting ready for this." "End Of The Road" could last three years. The first leg of the global trek wraps April 13 in Birmingham, Alabama. Thayer recently told Russia's TASS that he might "still be involved with KISS in a different way" once the band retires from touring. Tommy plans to take part in other projects. "It will probably be something which is associated with music or the entertainment business for sure," he said. Thayer joined KISS in February 2003, stepping into the boots the band's original axeman, Ace Frehley, had been occupying for the KISS reunion that lasted from 1996 to 2002.